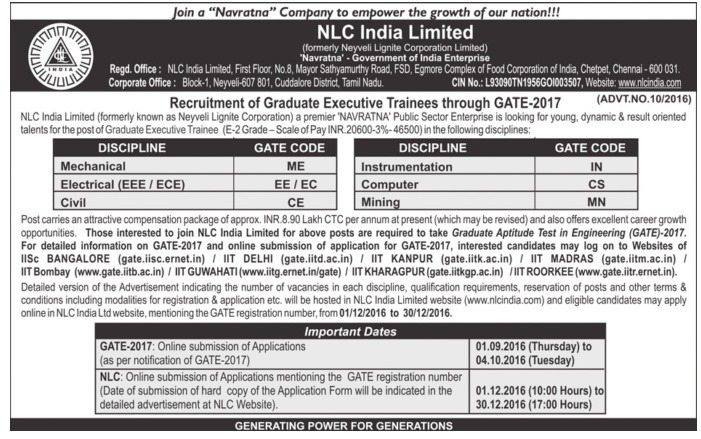 Neyveli Lignite Corporation Limited i.e NLC India Limited is looking for the post of Graduate Executive Trainee (GET) in the discipline of Mechanical, Electrical, Civil, Instrumentation, Computer and Mining through GATE-2017. The NLC India GET recruitment online applications start from 1st December 2016 and close on 30th December 2016. • Graduate Aptitude Test in Engineering (GATE)-2017. • The GATE 2017 Online Registration close on 4th October 2016. The candidates need to apply through online NLC submission of applications mentioning the GATE registration number, the Registration start from 01/12/2016 at 10:00 Hours to 30/12/2016 up to 17:00 Hours.